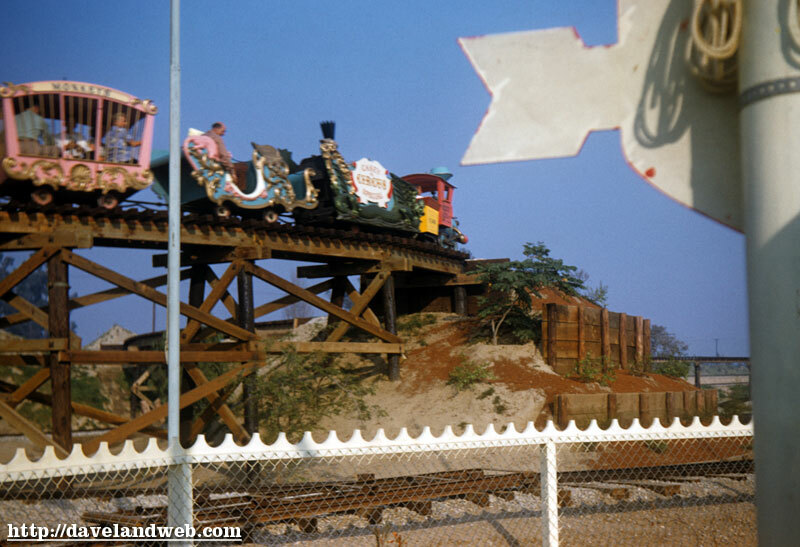 Here are 2 early but undated views of Casey Jr., chugging along the track over what appears to be somewhat unstable wood supports! 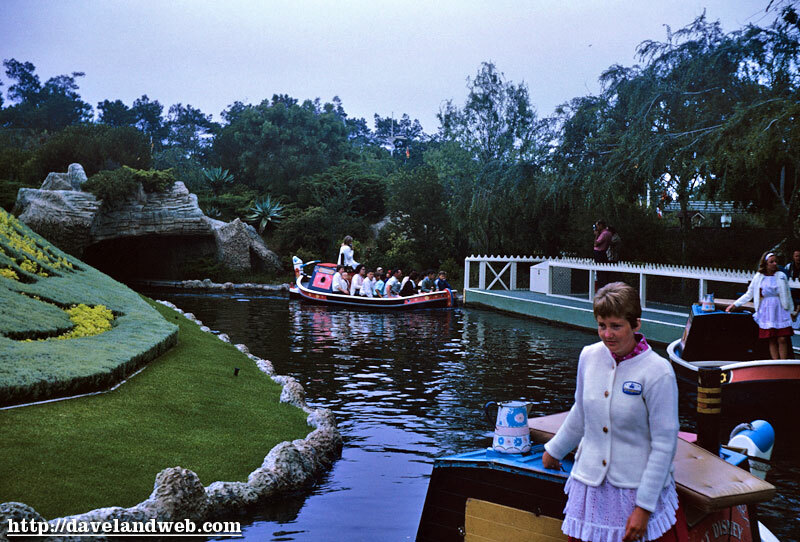 I would imagine from the lack of grass, these were taken before the Canal Boats of the World became Storybook Land. 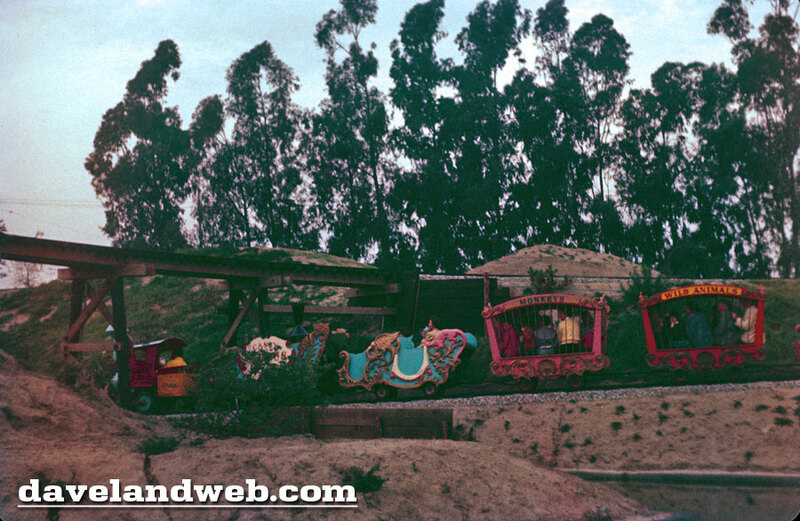 For more vintage & current Casey Jr. photos, visit my regular website. 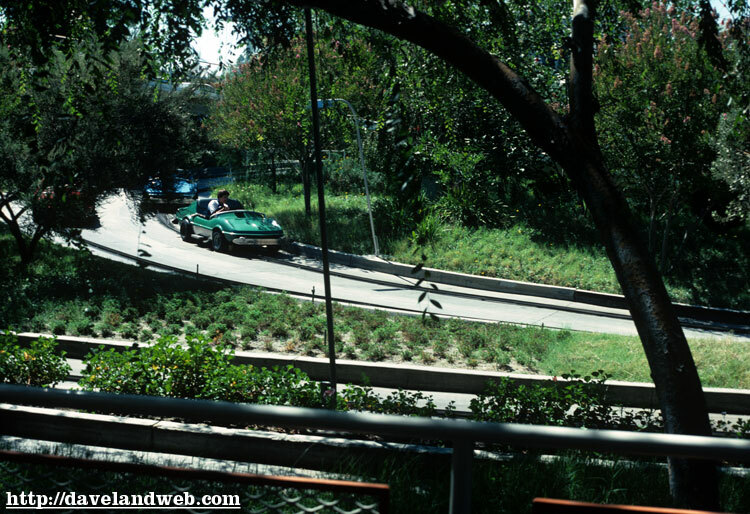 Image #1 is from October 1956 and gives a good overview of the Autopia; as always, so interesting to see how little is going on outside the park. 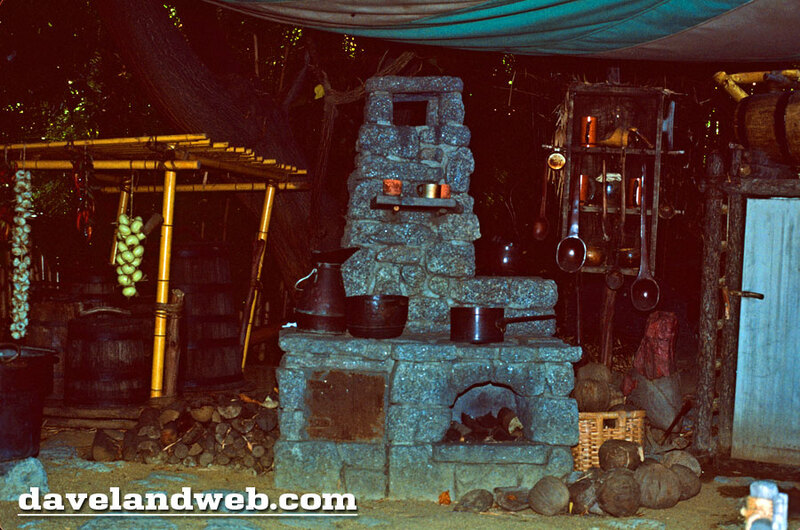 The place looks positively primitive! 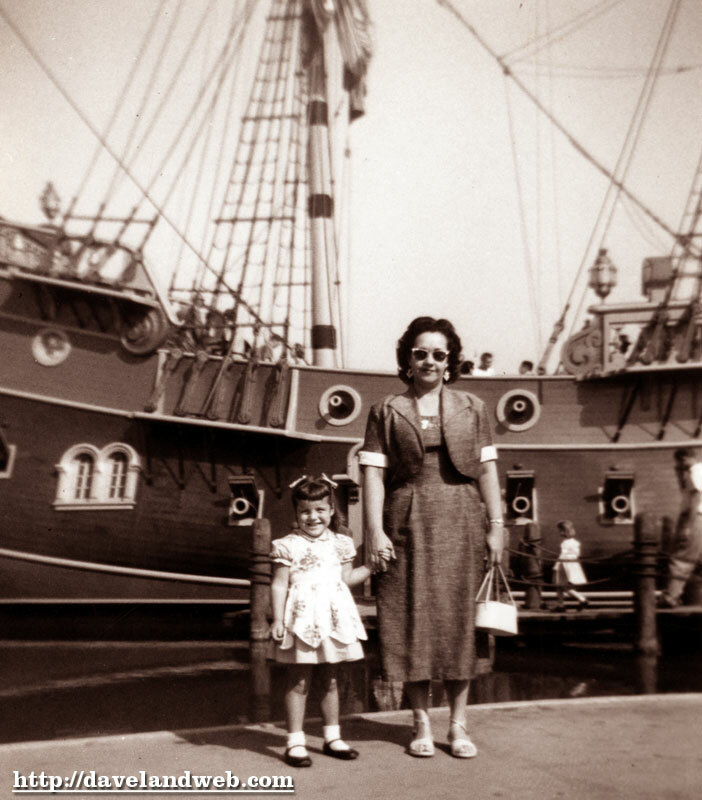 The next 2 shots are undated, but most likely late 1950’s. 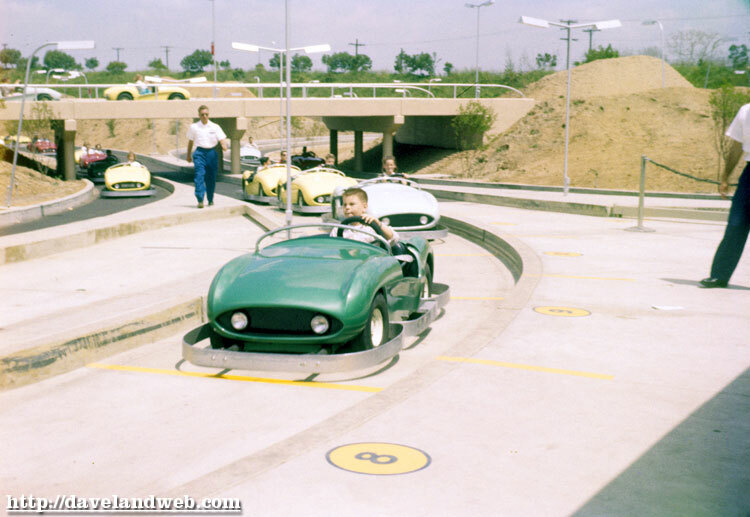 Check out little Pugsley in his green car! He’s much happier NOT to be with mom...she can be a real drag, even though she has the cool cat-eye glasses. 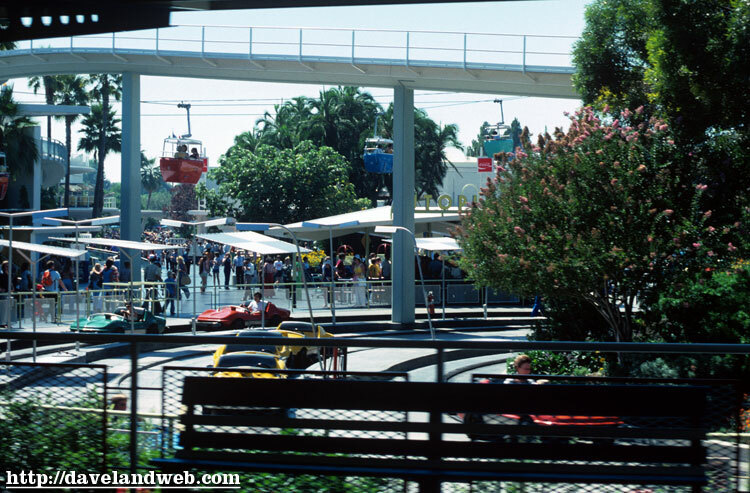 Moving onward to June 1960 is the loading area; a little blurry, but still a nice view of the cars themselves and the gas pump. Shooting ahead to the mod 70’s, the cars look very different, as do the Skyway buckets passing overhead. 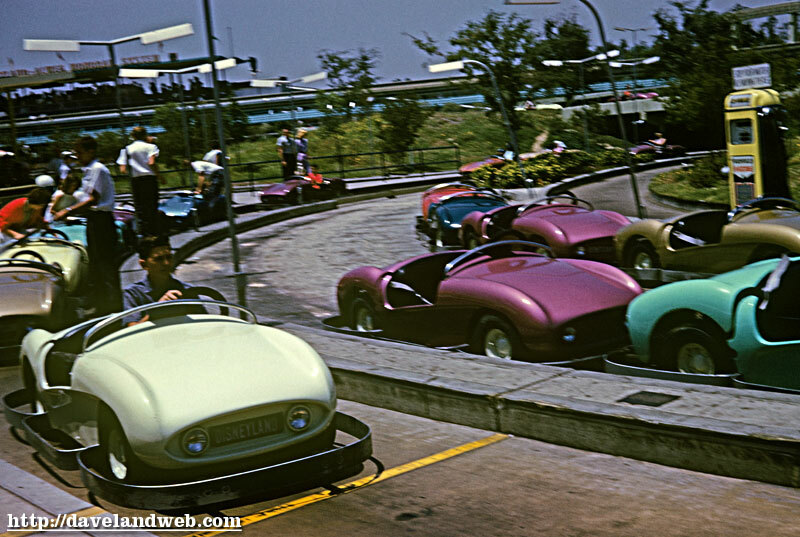 For more vintage & current Autopia photos, visit my regular website. 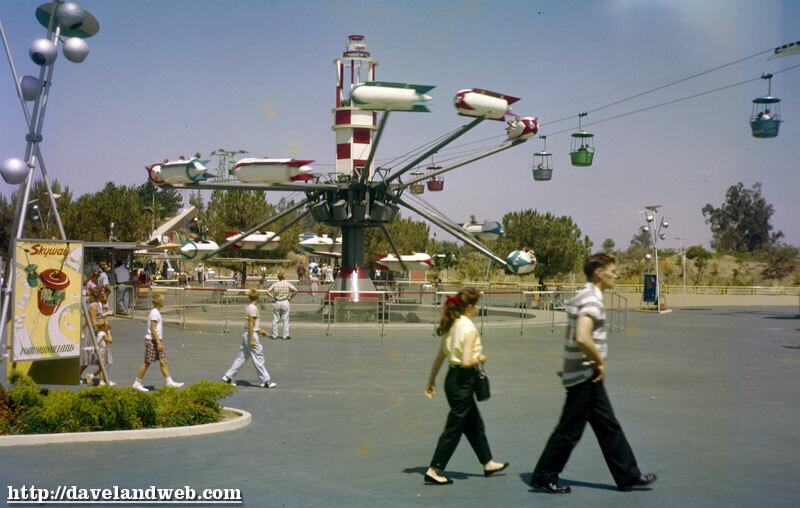 This undated slide features my favorite round Skyway buckets as well as the Astrojets, WAAAAY before it got remuddled, renamed, removed, and repainted with a metallic gold paint. 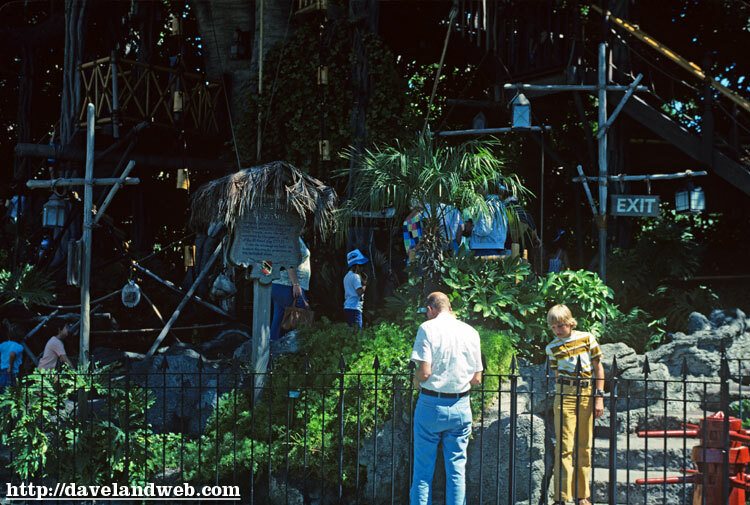 A nice touch to have the Skyway poster featured in the same shot as the attraction itself. 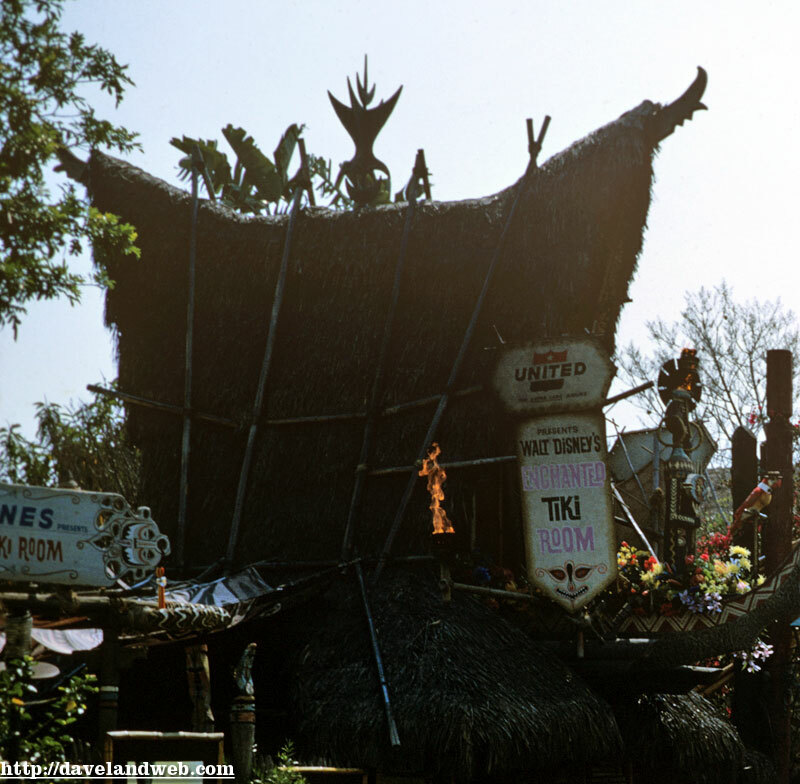 For more vintage & current Tomorrowland photos, visit my regular website. 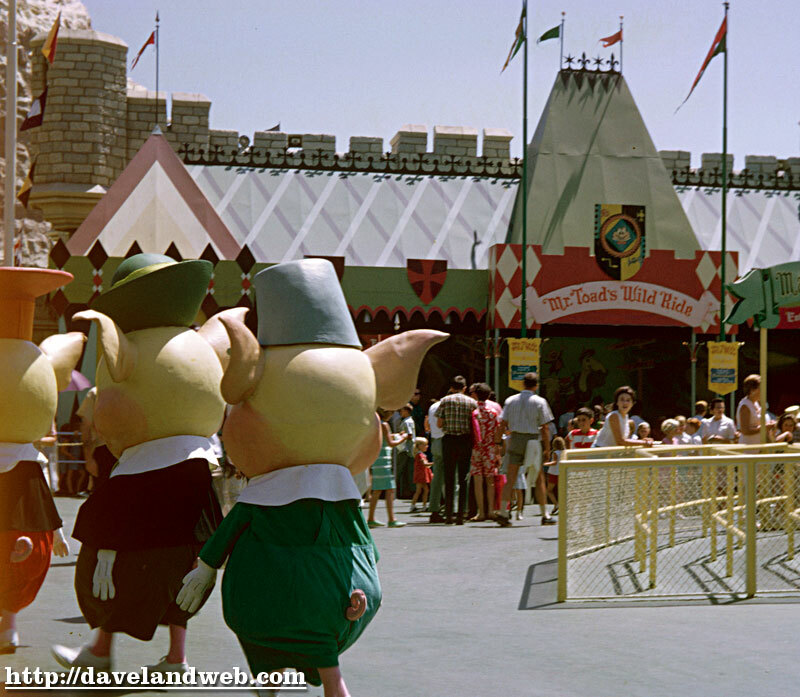 This undated shot of the Mr. Toad façade is most likely from 1959/1960. 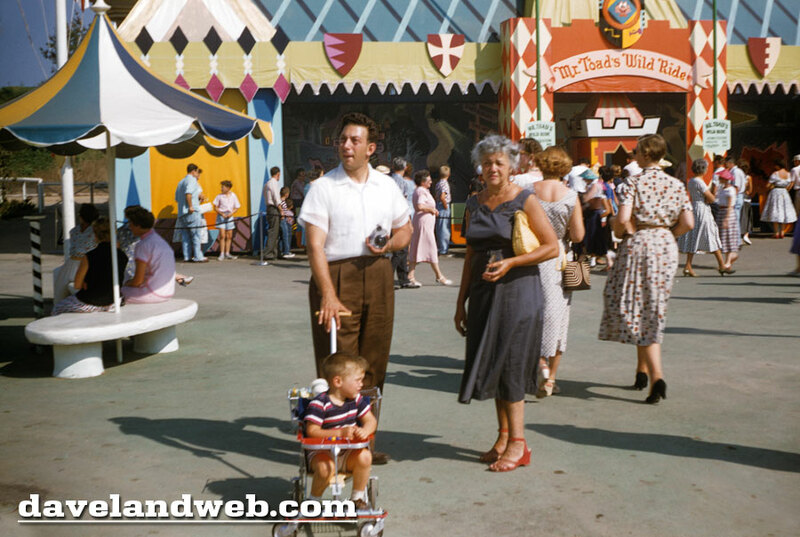 And yes, even though a stroller is in it, I am including it in my blog anyway. The halo around the gentleman’s head is because I did a little lightening behind him so that the mural on the wall would be visible.Here are two more vintage shots showing the old façade; first from October 1959 and the second from September 1966 (with a 3 Little Pig bonus!). I’ll conclude with a comparison photo of how the exterior looks today; I really do prefer the Tudor look. I feel it is more timeless. 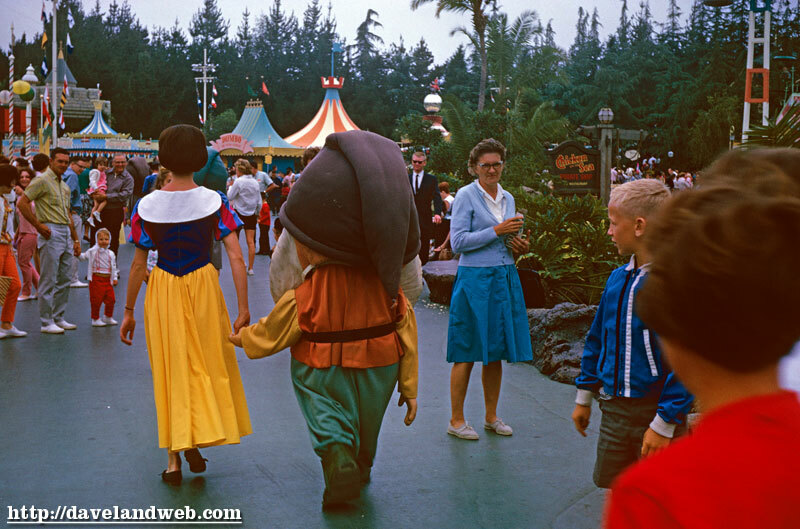 For more vintage & current Mr. Toad photos, visit my regular website. 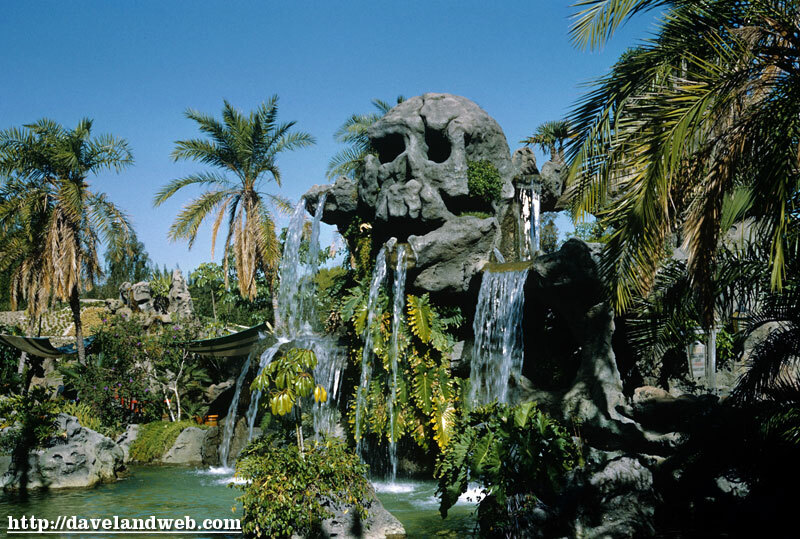 Imagine a land with no Tiki Room, no Barker BIrd, and no Dole Whip, and this is what you’d see. 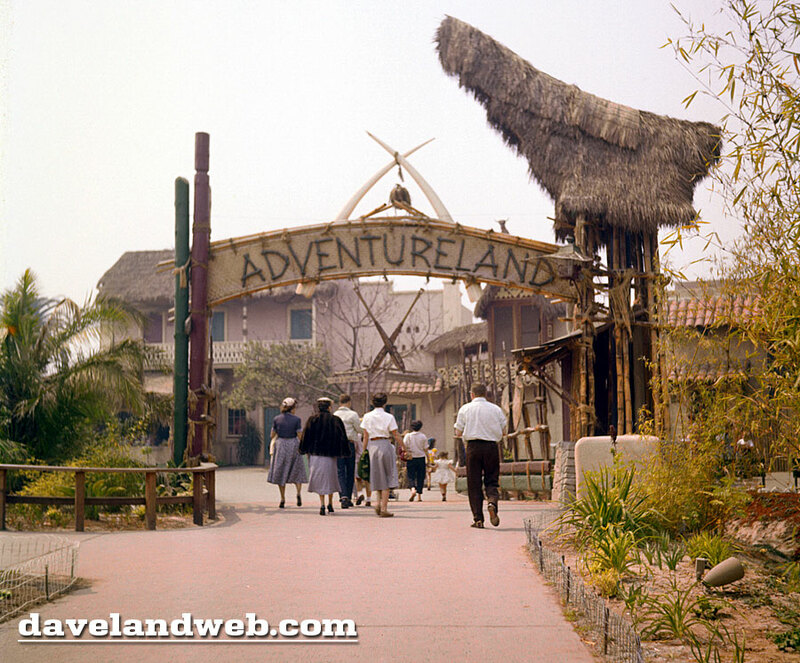 The entry to Adventureland looks positively barren in this early view. 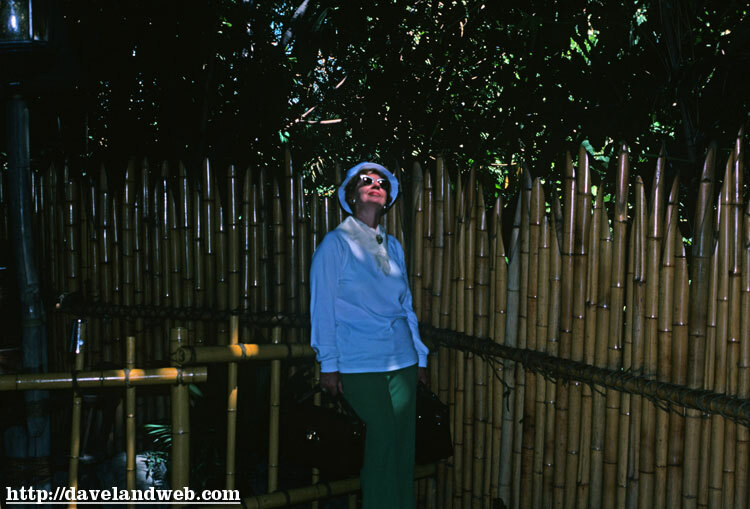 Shot 2 from the same roll shows the area behind Plaza Pavillion that would eventually become the Tahitian Terrace. 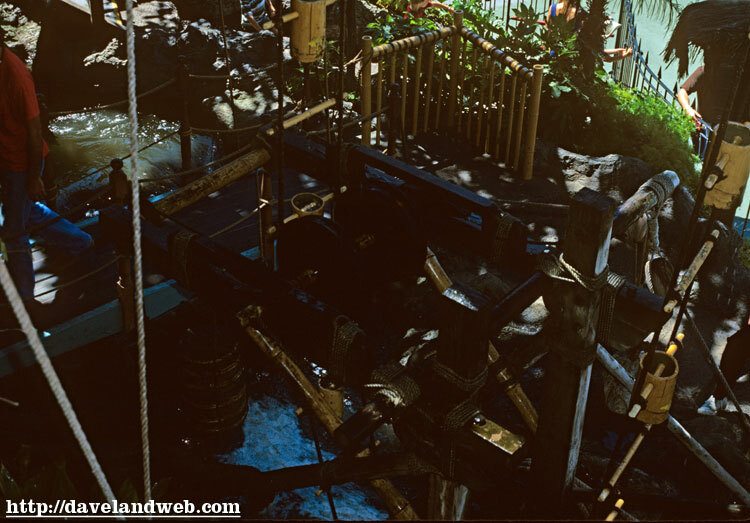 Please notice the little water fountain on the left; who says you can’t get a free drink at Disneyland?!? 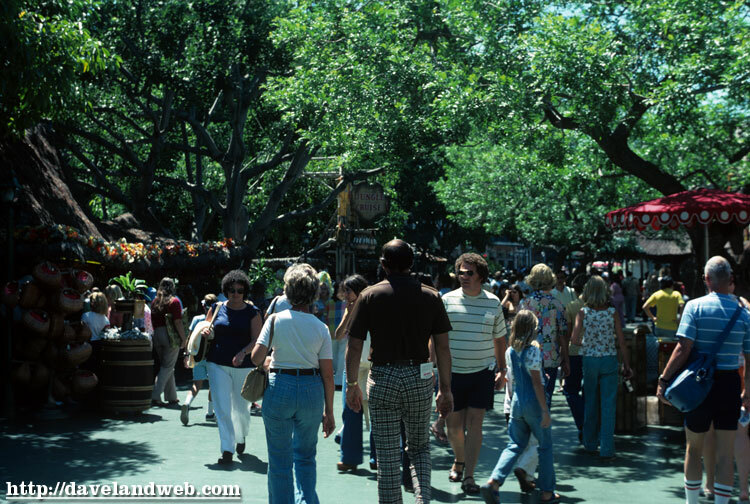 Fast forward 20 years to August 1976, and you have hoards of people and Greg Brady afros. 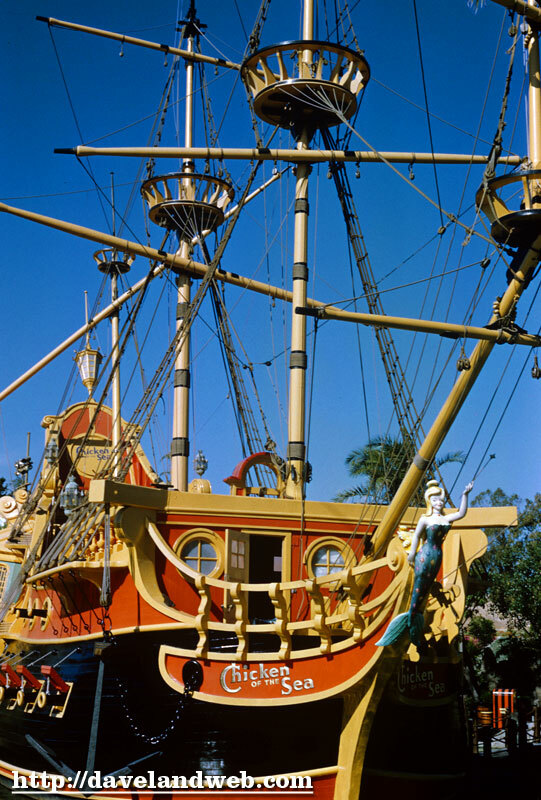 For more vintage & current Adventureland photos, visit my regular website. 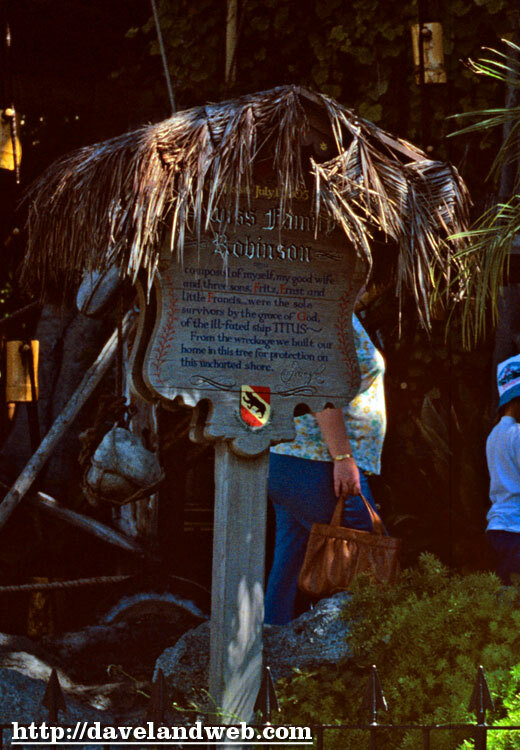 Signage, a roundbucket, and no strollers...what more could you ask for in a slide?!? 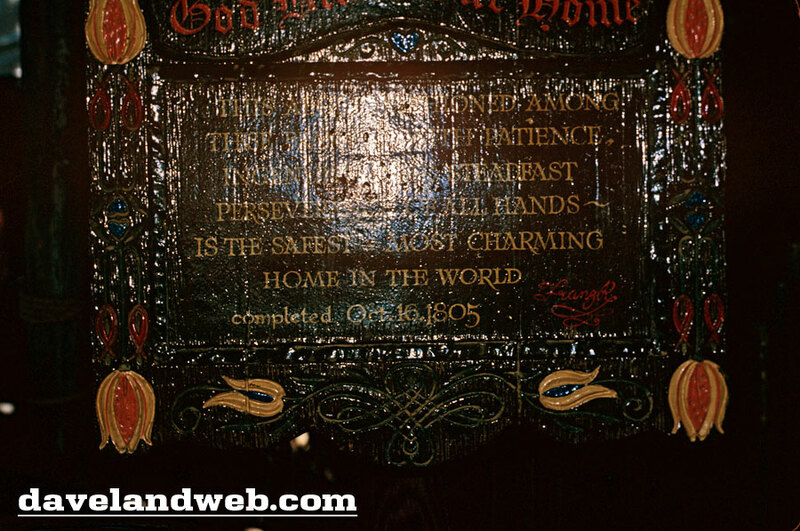 I have also included a photo of the sign and how it looks today. 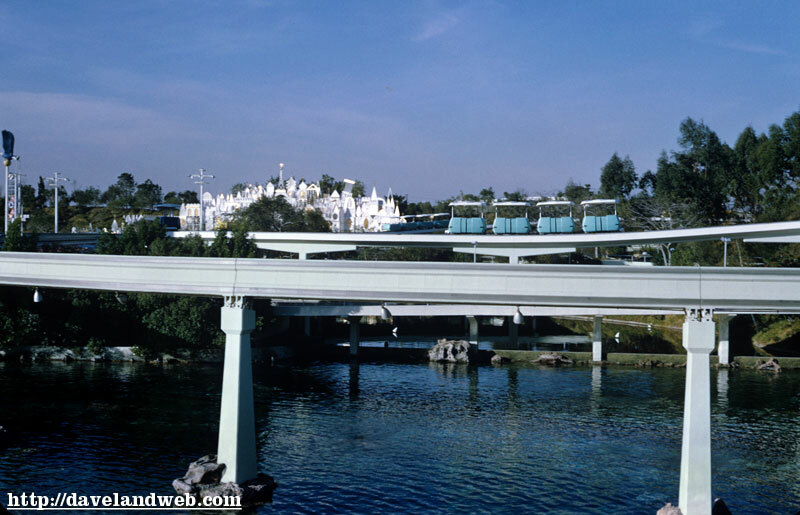 From January 1968 come these two shots showing the PeopleMover; shot 2 is really all about the Sub Voyage, until I zoom in on the closeup to feature the PM. 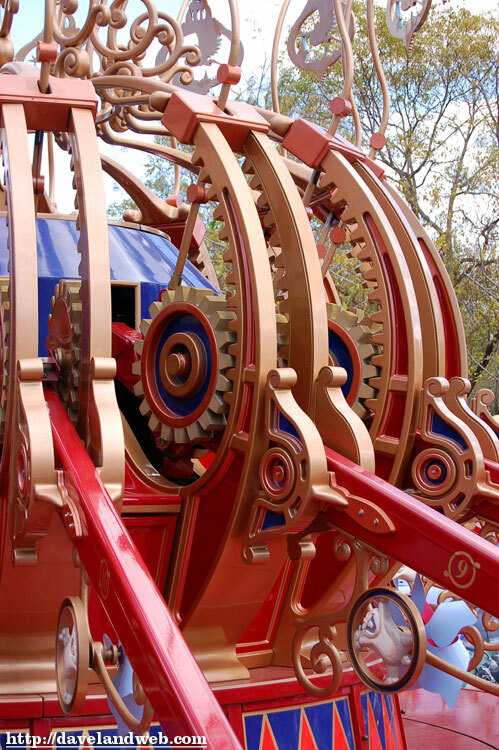 It really was a cool idea; a constantly moving vehicle that serves as a transportation device. 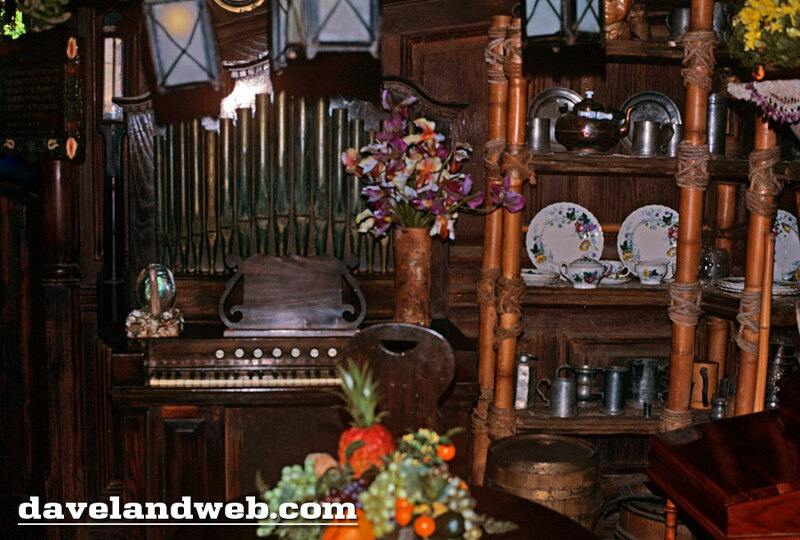 Had Walt lived, it would have been one of the main features of EPCOT. 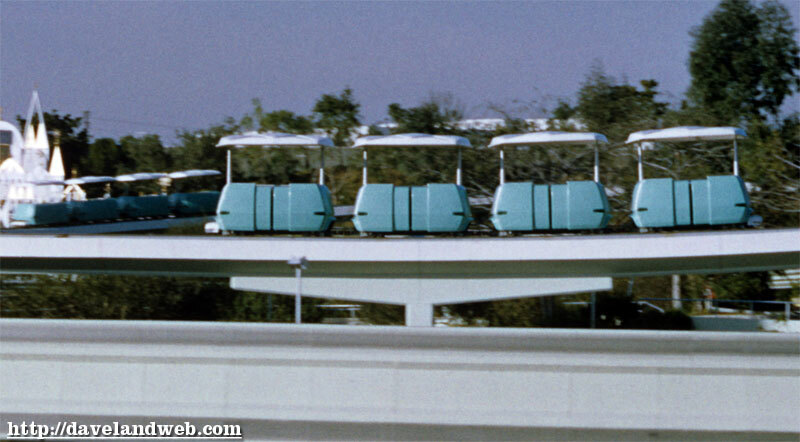 At this point, the PeopleMover is only a few months old, having just opened in July the year before. 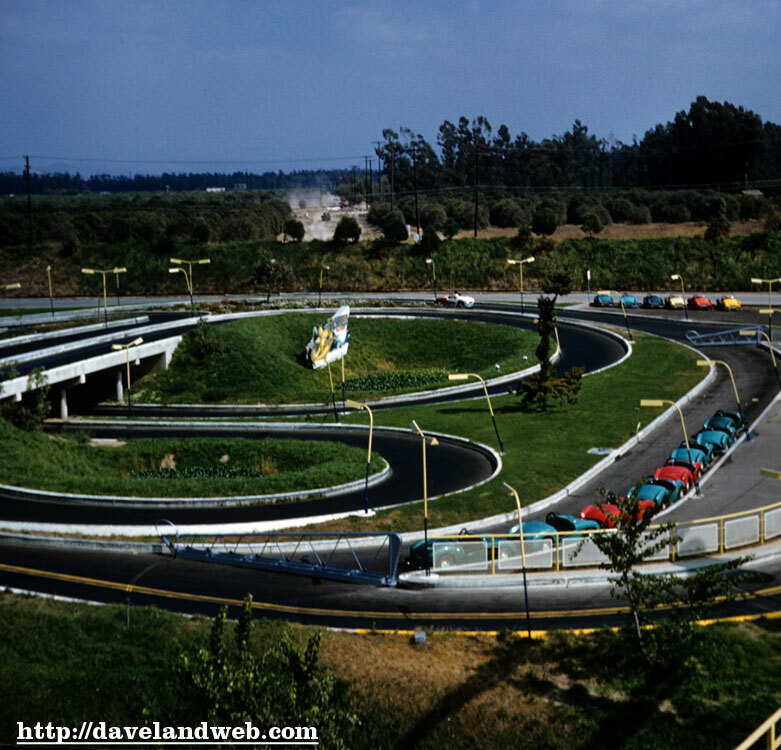 Hopefully the new regime at Disney will be able to put the unused track to good use again soon. 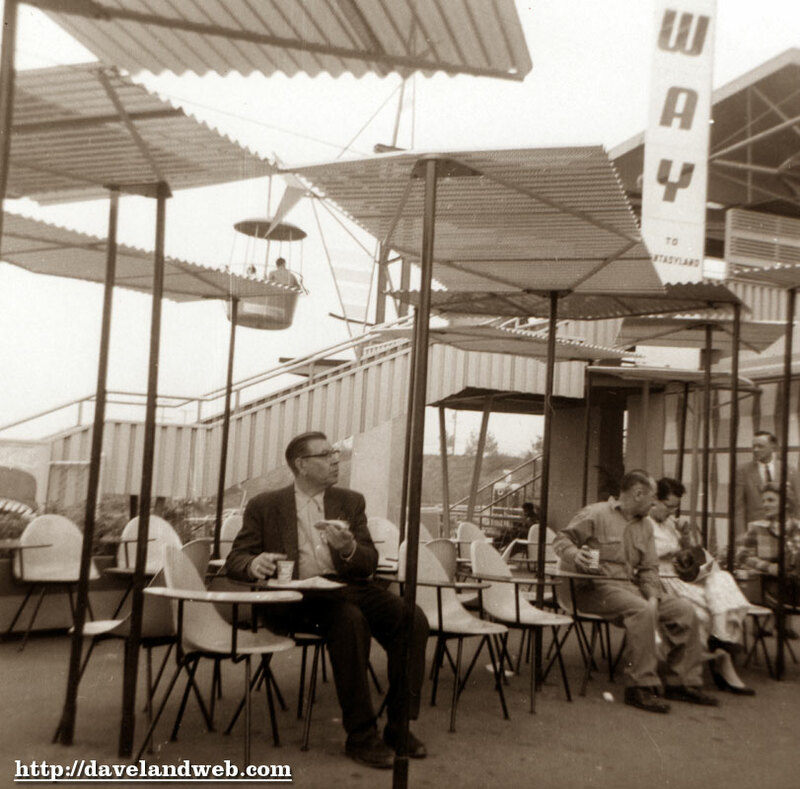 Today I present to you an undated 1950’s snapshot of a gentleman eating a hot dog at the Tomorrowland Space Bar, while a Skyway Bucket cruises overhead. Something to the right seems to have caught his attention; maybe it’s a girl in a space suit. 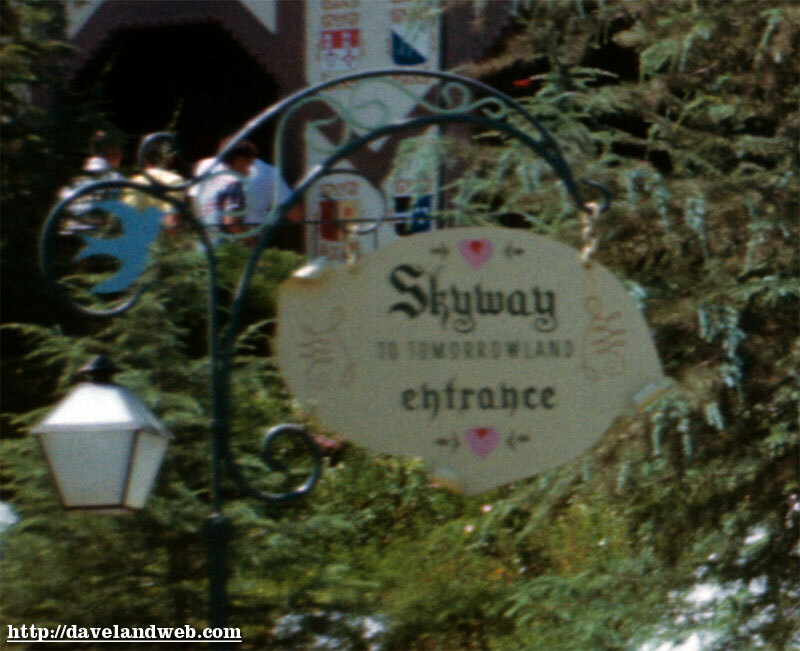 For more vintage & current Tomorrowland photos, visit my regular website. 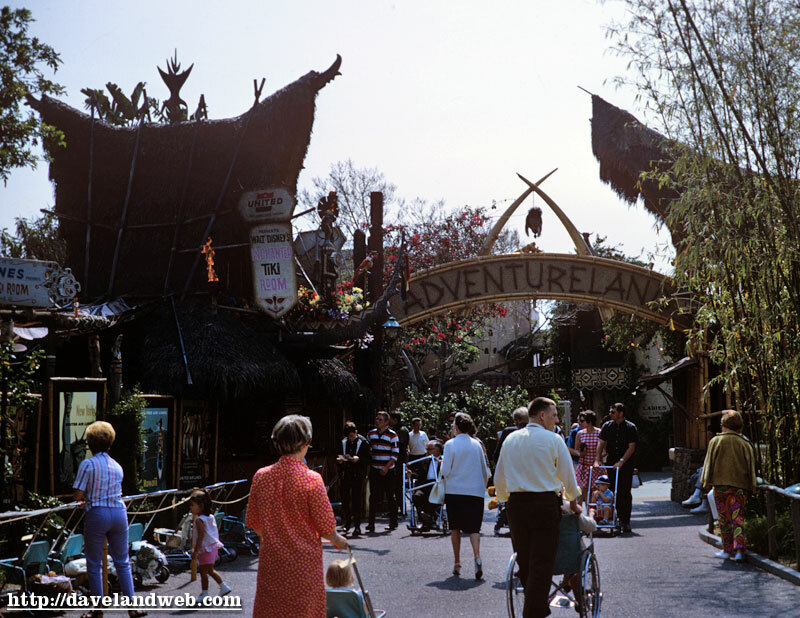 May 1967 brings us this photo showing the famous Adventureland arch as well as the entrance to the Tiki Room; be sure not to miss the very large bouffant on the left. 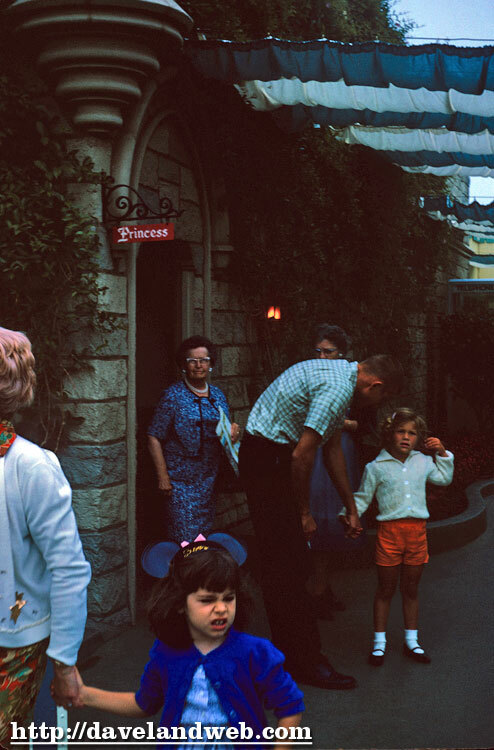 Even in 1967, there are a ton-o-strollers. 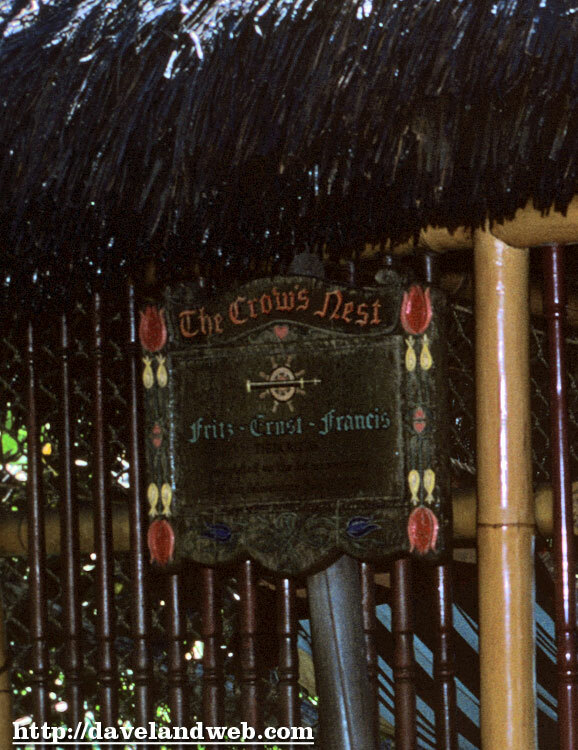 I have also zoomed in on the United Airlines sign/Jose the Barker Bird area. 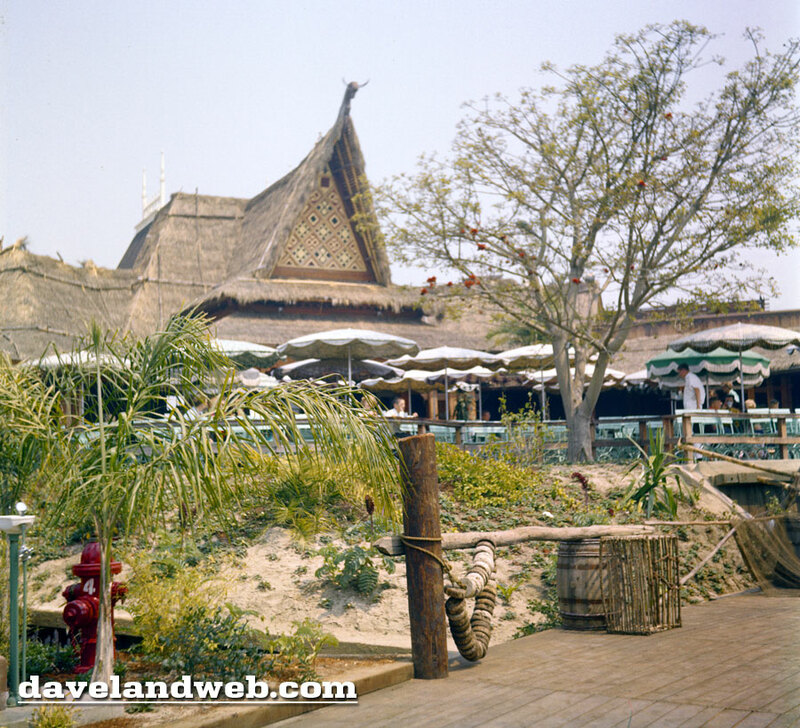 For more vintage & current Tiki Room photos, visit my regular website. 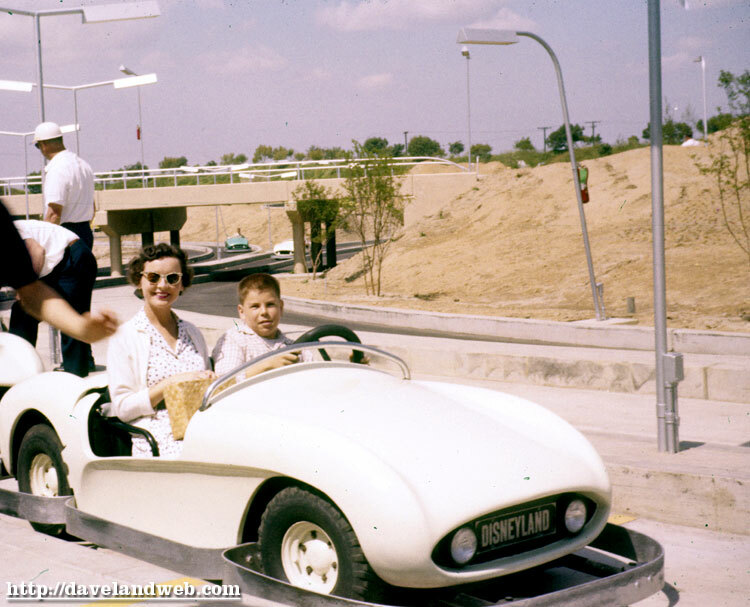 This November 1955 shot would be so obviously vintage even if it weren’t in black and white. 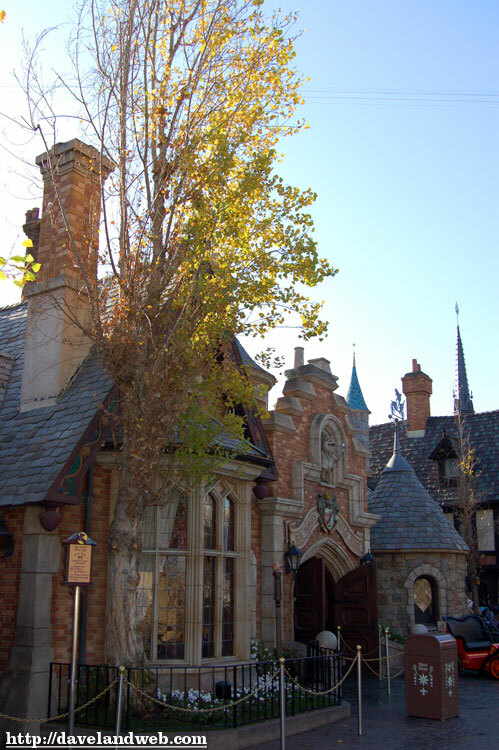 The little girl in her crisply pressed outfit is nowhere to be found in Fantasyland today. 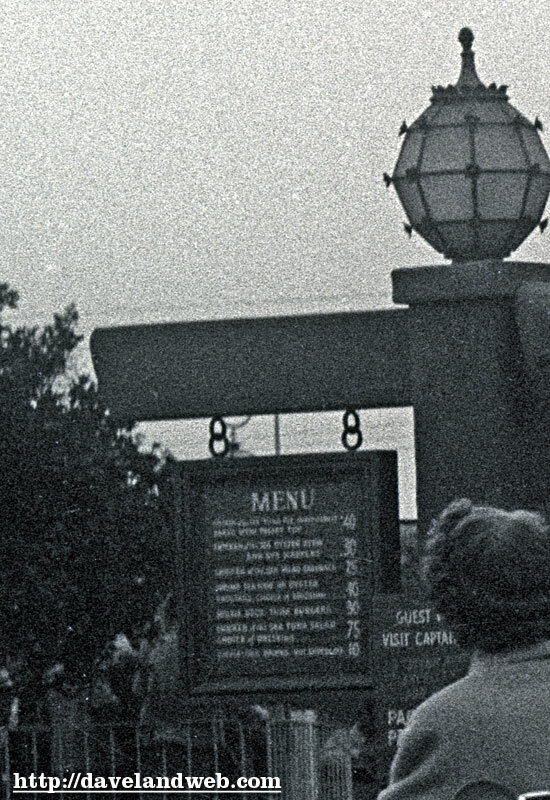 Next up is a grainy closeup from 1955 of the menu posted in front of the ship. 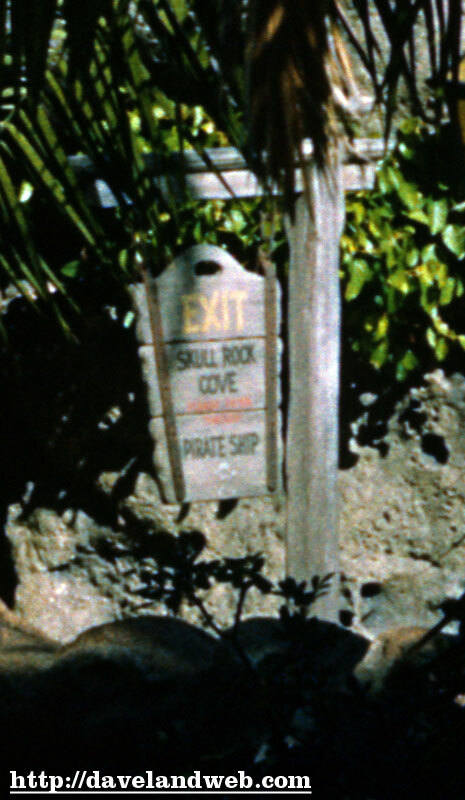 From January 1968 comes this set of COTS and Skull Rock photos, including a detailed shot of the Skull Rock Cove exit sign. 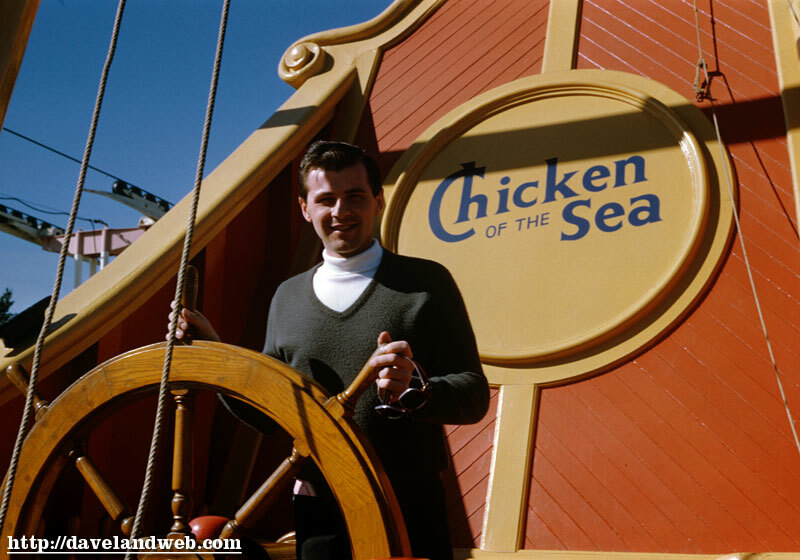 For more vintage & current Chicken of the Sea and Skull Rock photos, visit my regular website. 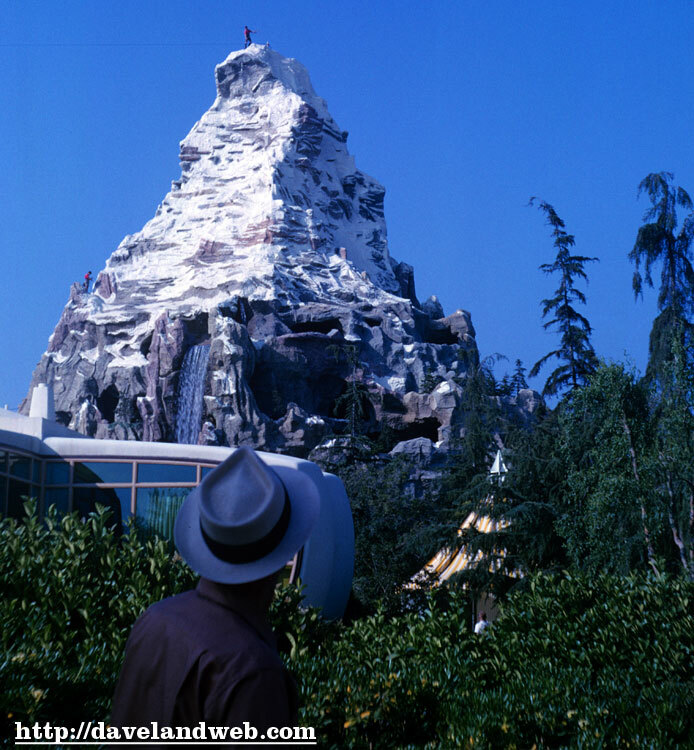 Probably just a happy accident, but I do love the composition of this one; a man in a fedora looking over the House of the Future to see a climber on top of the Matterhorn in June 1964. Brilliant! 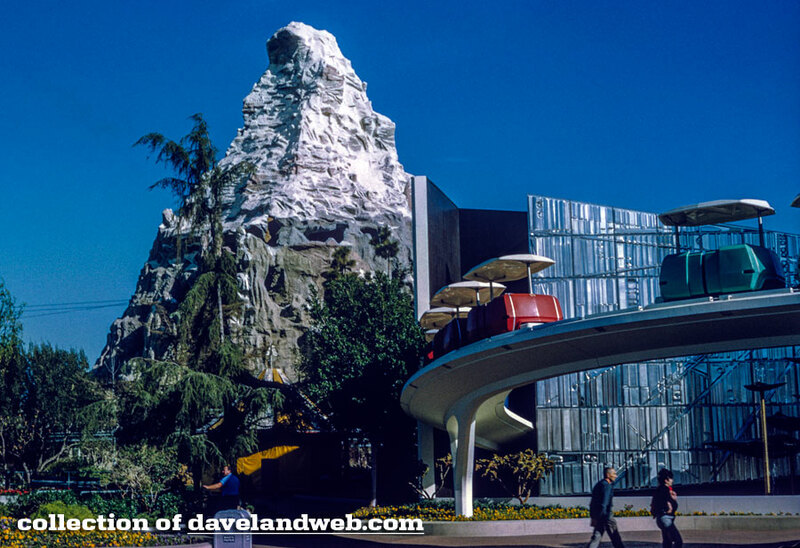 A little less than five years later in February 1969, the landscape has changed as the House of the Future has been dozed. What’s better than a jolt from a cup of joe? 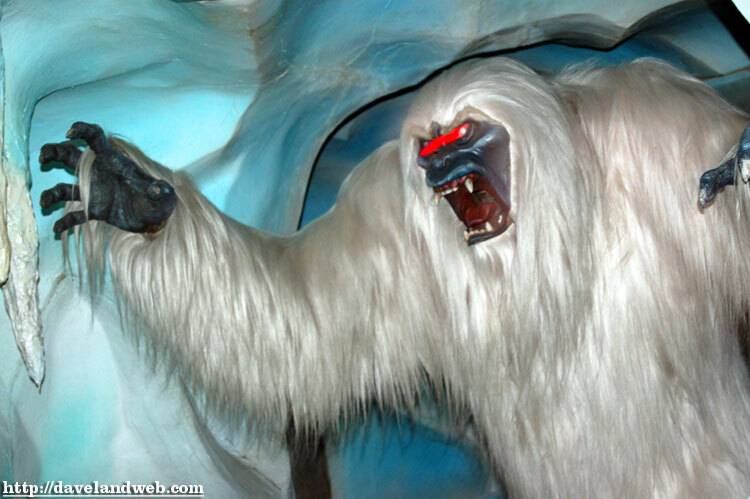 How about a roar from the Yeti! 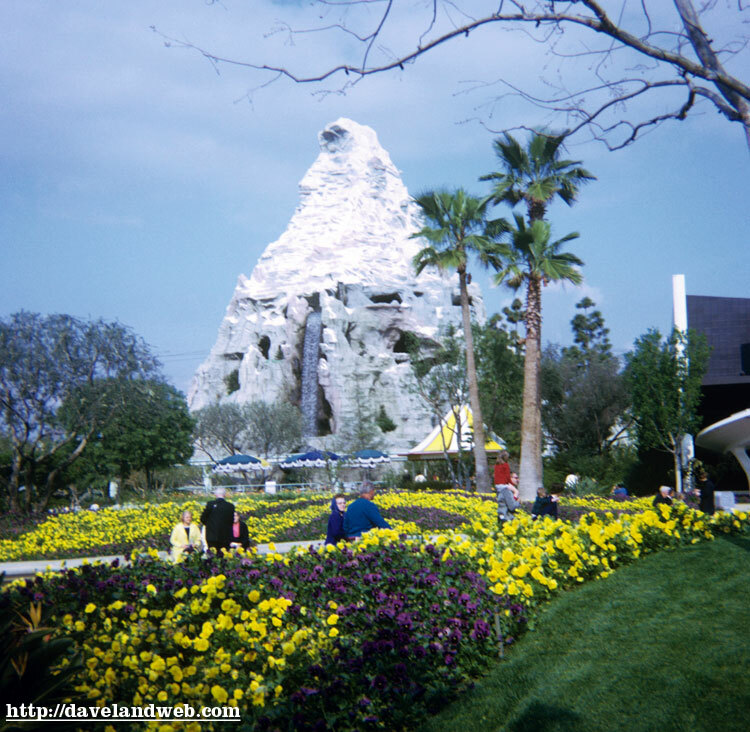 For more vintage & current Matterhorn photos, visit my regular website. C’mon sweetie...look alive! 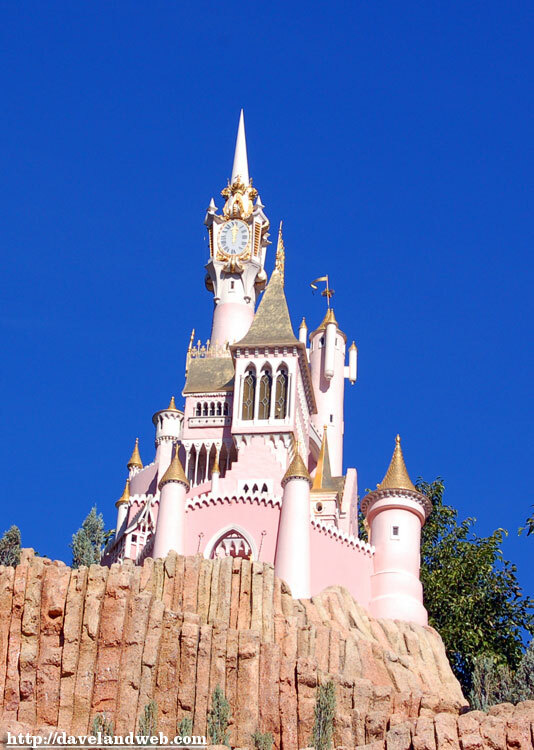 You’re a Disneyland Cast Member! This poor lass looks like she hasn’t had her coffee yet. 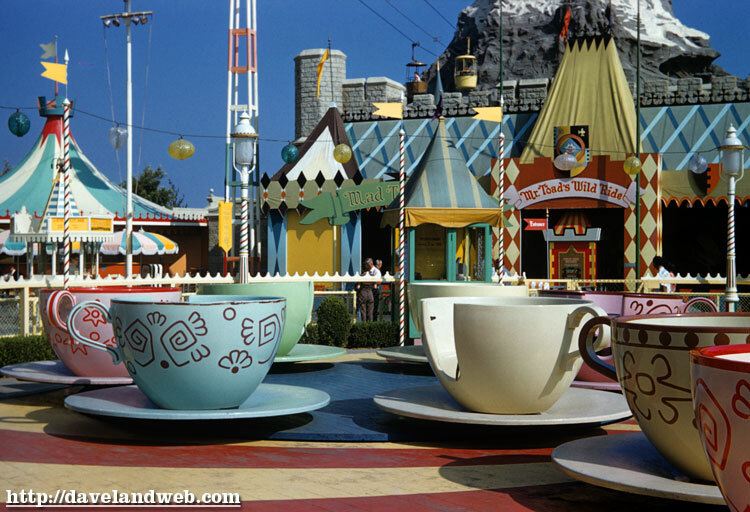 Of course she hasn’t; it’s June 1964, and about the only coffee she’s going to get is over at Town Square in the Hills Brother Coffee House. Photo #2 is of three lasses waiting for their Extreme Makeover. Just kidding. 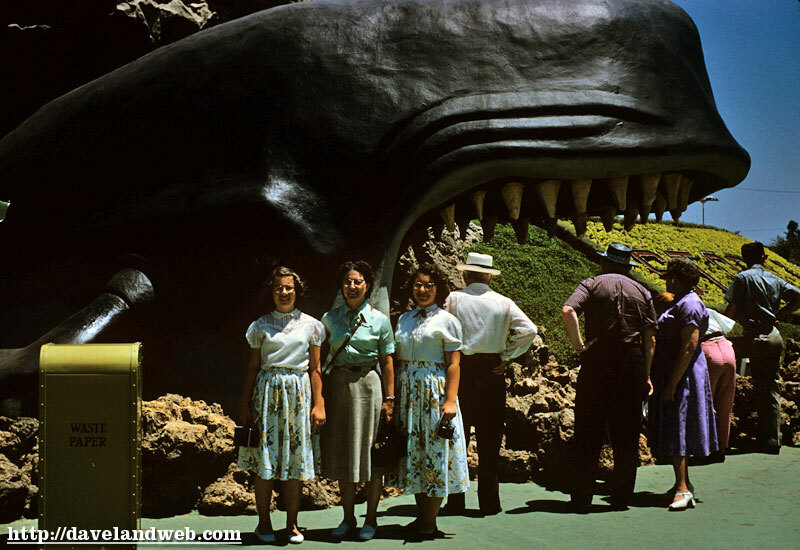 This shot in front of Black Monstro is undated from the 1950’s. 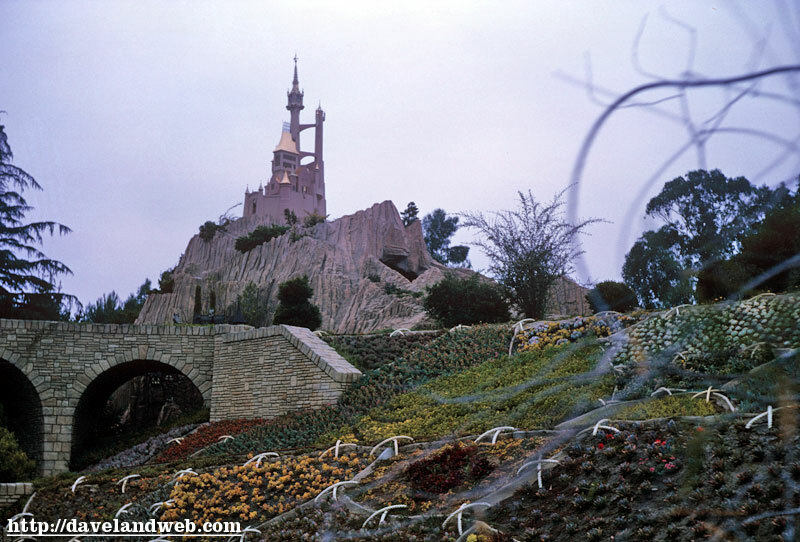 A visit to Storybook Land wouldn’t be complete without a shot of Cinderella’s Castle from June 1964. 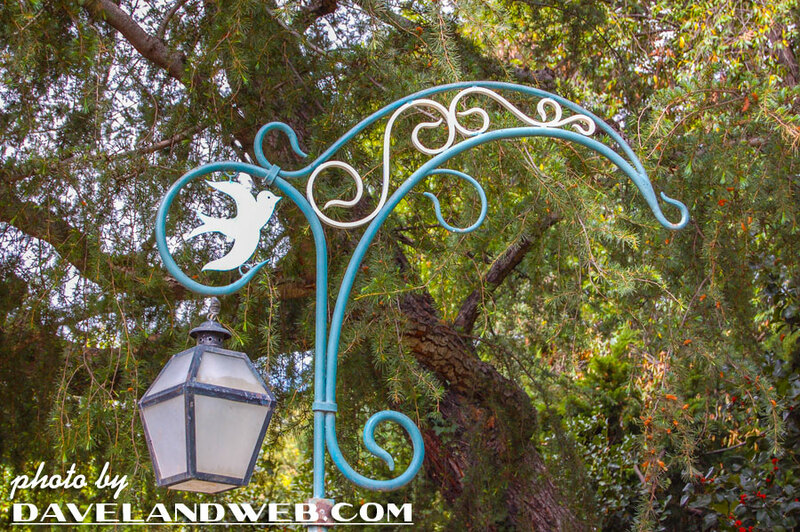 For more vintage & current Storybook photos, visit my regular website. 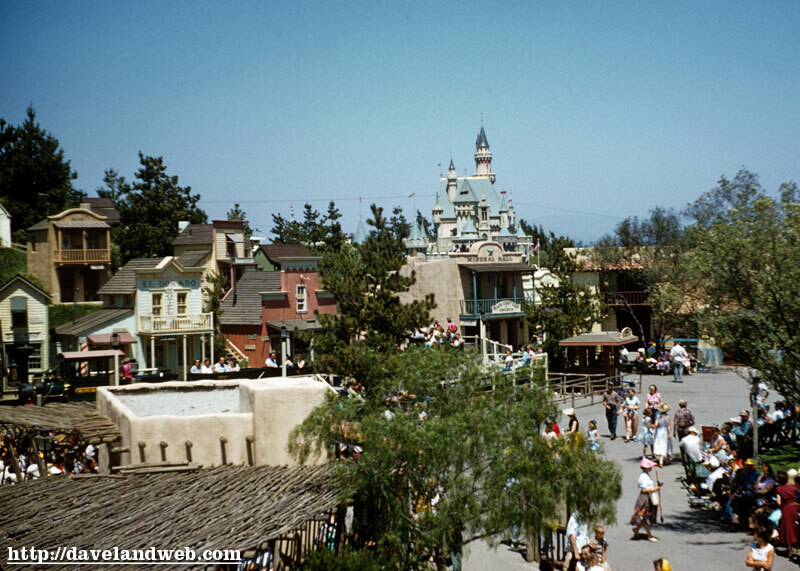 Here are 2 from the old western town of Rainbow Ridge, located in a corner of Frontierland. 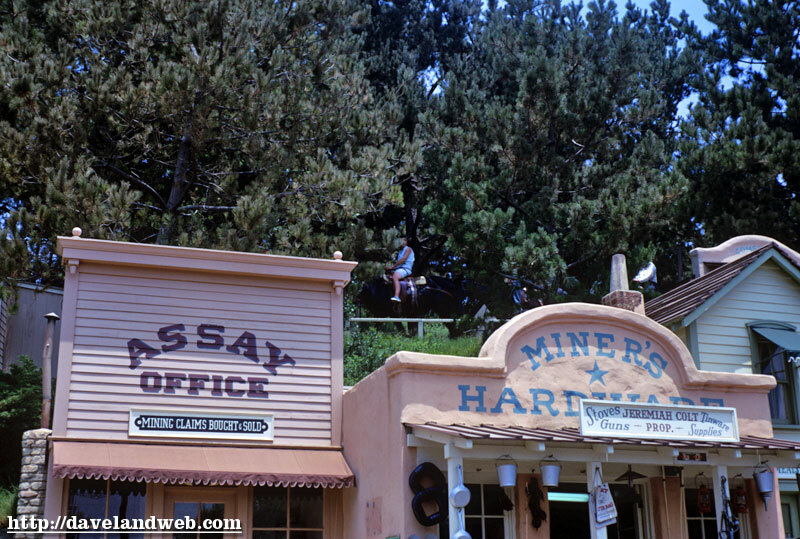 Shot #1 is from July 1967, and shows some of those newfangled settlers up above riding those durn pack mules. 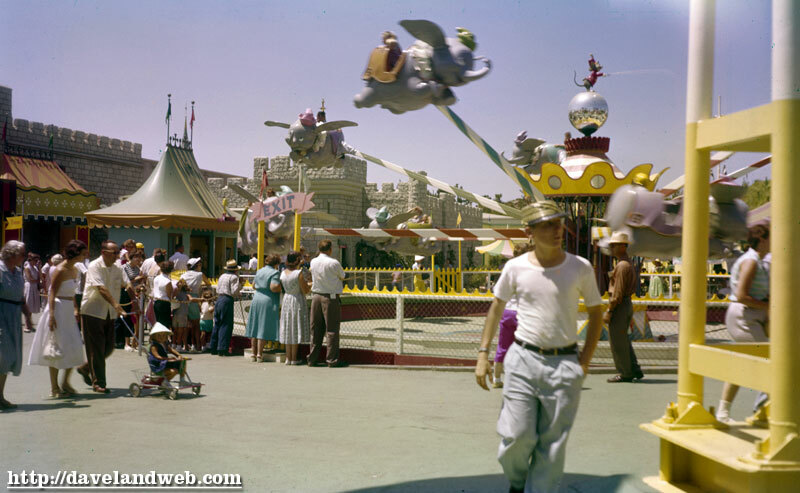 Shot #2 is undated (most likely 1950’s) and gives you a birdseye view of RR. 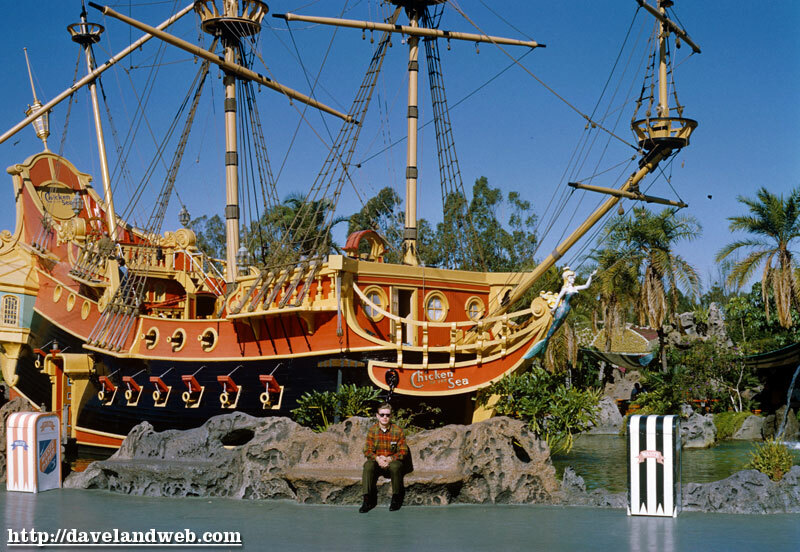 For more vintage & current Rainbow Ridge photos, visit my regular website. 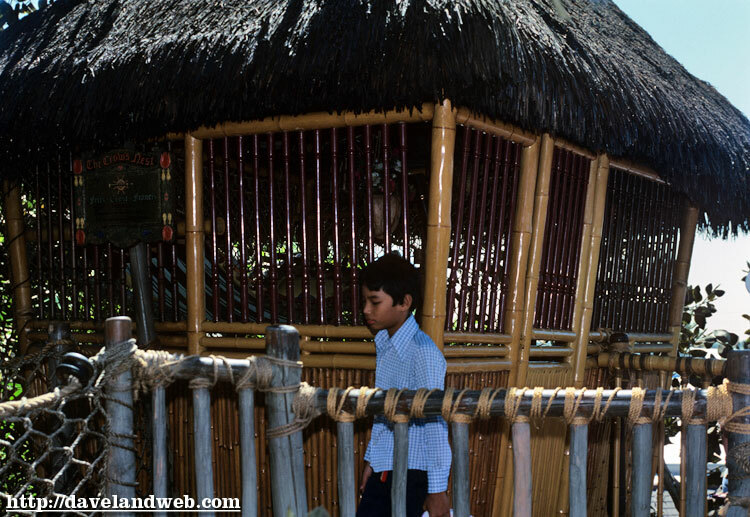 On the bright side, the Treehouse is now open again for tours after a mini-rehab. 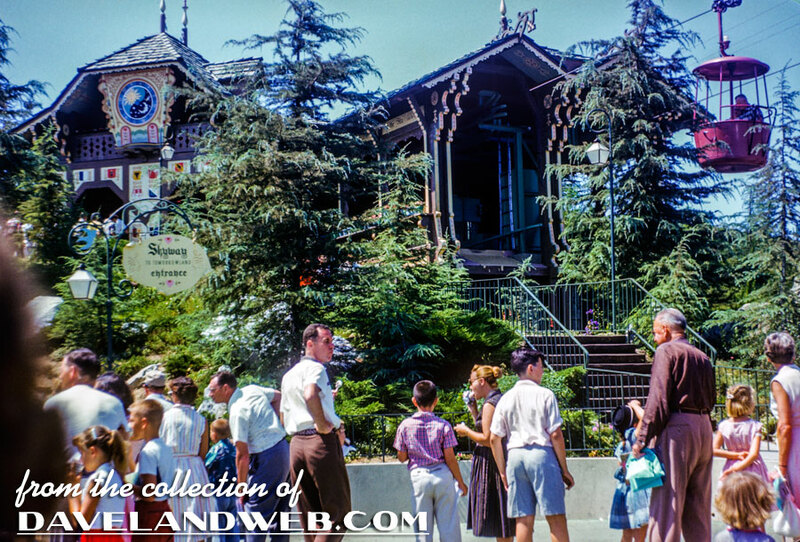 For more vintage & current Treehouse photos, visit my regular website.